During the early morning of December 1, 1948, the body of a man was discovered on Somerton Beach in Australia. Little did the the authorities on the scene realize that they were about to witness the birth of a very strange mystery. The man discovered that day was in peak physical condition and as dressed very well, but all of the labels on his clothing had been removed. In his pocket was a train ticket for a ride he obviously missed on account of his being dead and all. Although investigators believed that the man must have been poisoned, no traces of any foreign agent was discovered during an autopsy. 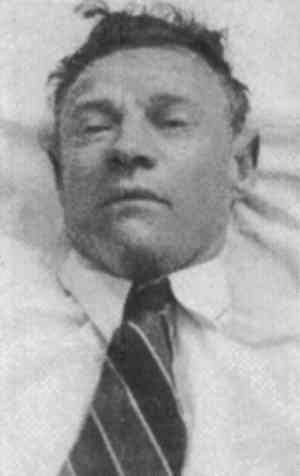 Some still maintain that the Somerton Man died of some type of undetectable poisoning because there was no other explanation for his death. A month later police discovered a brown suitcase at Adelaide Railway station that might have belonged to the mysterious Somerton Man. The brown suitcase had its label removed just like the unidentified man’s clothing and inside were clothes that had also had the labels removed. Inside the bag was a stenciling brush, electrician’s screwdriver, and a pair of scissors normally used for stenciling. Unfortunately, the suitcase proved to be another dead end. With all leads non-existent, the months passed by until June of 1949 when investigators had the body re-examined and discovered a secret pocket in the man’s clothing that contained a scrap of paper with the words “Taman Shud” printed on it. Upon a closer inspection of the paper it was discovered that the scrap came from a collection of poems entitled The Rubaiyat of Omar Khayyam. This discovery led to a media blitz in an attempt to find the book the page was torn from. The campaign was successful as a man stepped forward with a rare first edition copy of Edward Fitzgerald’s translation of The Rubaiyat, which he said he found in the back seat of his car the night before the unidentified man’s body was found. In the back of the book scrawled out faintly in pencil was a strange code. Also written in the book was the phone number of a former nurse who, while serving in World War II, gave a copy of The Rubaiyat to an army officer named Alfred Boxall. Boxall's copy of The Rubaiyat was still intact, though, and both parties denied any connection to the unidentified dead man. Even now, after over 60 years, the mystery of the Somerton Man remains unsolved. No one knows who he was, what the phrase "Taman Shud" was supposed to mean, or what the mysterious code is supposed to represent. There has been speculation over the years that the man was a spy, but none of it has remotely been proven.